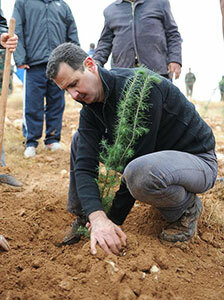 He is President Bashar Hafez Al-Assad of the Syrian Arab Republic; the most popular and human among all. 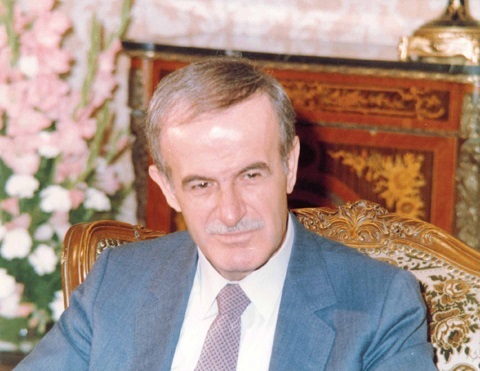 For the majority- hence consensus never happened in history even when it came of saints and prophets, if not to God himself- President Al-Assad is a close friend for every Syrian, sympathetic and kind father for every Syrian child, and the source of wisdom and leadership for politicians, and above all, H.E. 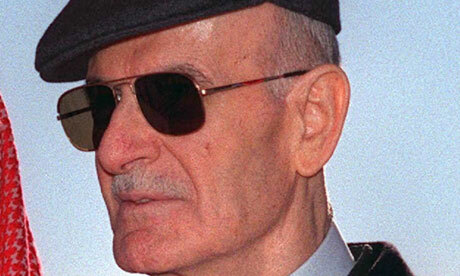 Al-Assad is the guardian custodian angel of Syria, the cradle of civilization; he is the general Commander of Syrian Army and security forces. Had it not been for such a great Army and a courageous commander, Syria would have been by now the flesh for every ewe, colonialist, wahabi and terrorist. 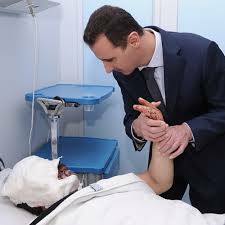 This is why the majority has been crying ''with our soul, and blood, we sacrifice ourselves for Bashar Al-Assad''. 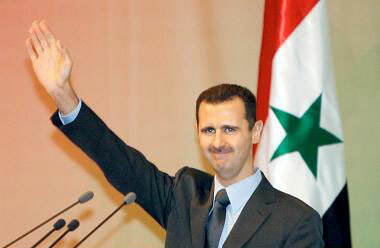 Yes, he is the man and the only man representing all of Syria, if not the only man in Bilad Al-Sham. There is a Guardian Angel for everyone you know!!! Vladimir Putin, the Russian president, December 1, 2014. Actress Sullaf Fawakhirji, November, 2014. 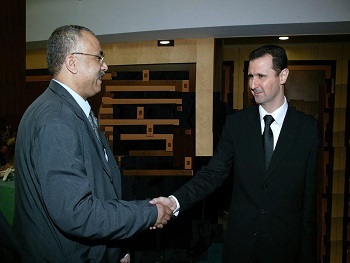 "President Bashar Al-Assad is a very good-hearted man of morals and principles, who was developing and reforming Syria before the sinister scheme was hatched against Syria." Thierry Meyssan, a French journalist, author and analyst, October 17, 2014. 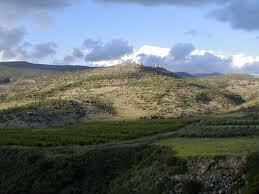 Dear President Bashar al-Assad, There is a Guardian Angel for everyone you know! Thank you for being there for your country. I believe you have been misunderstood in the world and are a true and kind leader for your country. Try to believe in your Guardian Angel’s that watch over you as they will show you how to become a truly Great leader in our time. Bill Pfohl ,Colorado USA The White Light Guardian Angel Racing Team,May 5, 2014. 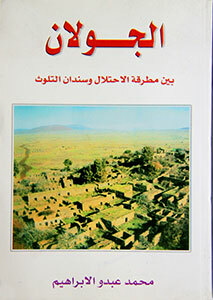 Dear Mr Baschar,i look many Videos on Youtube from War in Syria! but when,the beautiful Syria is under the control of this Scum,God bless then we have the Present! They are Animals and they must be defeated! A great Country and civilization would be lost! and these threats,on the part of Americans ,make me so angry! Would the Americans on your basic, from Terrorist...are attacked. Then these would be required with all resources destroy! 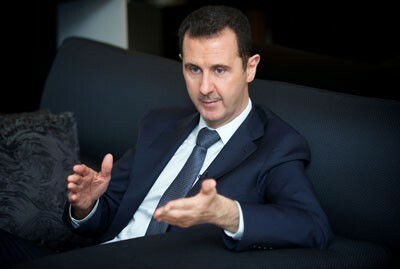 "Today, we need a leader, we don’t only need managers and Dr. Bashar al-Assad is a great leader. So I will vote for him and I think that he is a great person as he demonstrated to be a great person,"
"President Bashar al-Assad was clear and crucial when he reiterated that the real security of the Arab nation can be realized through keeping the Palestinian cause as a core issue based on principles and facts,"
"The Syrian leadership has once more proved strength of nerve, strategic mind and wisdom in confronting Israel and its aggressions." 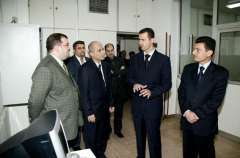 "President Al-Assad has never been absent even for a single moment from participating in all activities and national occasions. H.E. President Al-Assad has been carrying out his constitutional and national duties to the best of performance,"
His eminence Sayyed Nasrallah, May 9, 2013. "The majority of the Syrians do love president Al-Assad, who does symbolize for them every heroism, resistance, steadfastness and dignity. President Al-Assad is almost felt to be part of every Syrian family; and the more he is to be under attack by the ewes and their masters, the more he is to be immunized by the solidarity, unity, friendship and amity of his people"
Minister of Information, Omran al-Zoubi,May 4, 2013. Since the retirement of Fidel Castro, Hugo Chavez’s death and the interdiction of Mahmoud Ahmadinejad to nominate a candidate in Iran’s presidential election, the revolutionary movement is absent a world leader. Or rather, was absent a world leader. However, the incredible tenacity and composure of Bashar al-Assad has made him the only chief executive in the world surviving a concerted attack by a vast colonial coalition led by Washington and being largely re-elected by his people.